At anchor in Bryans Corner at the end of the Freycinet Peninsula. We left Wineglass Bay yesterday morning after a rather rollie night at anchor and a fair infestation of mossies. Actually I wasn't aware of any rolling because I slept like a log ... but George and Bruce didn't sleep too well due to the constant motion of the boat. Bruce said he battled mosquitos all night and, again, I didn't hear them buzzing around because I slept so well but I've got the itchy bumps on my head and arms to prove they were there all the same. The plan was to leave early and sail down through the Schouten Passage before the wind got up to the forecast speed of 20-25 knots. As we said goodbye to Wineglass Bay the main went up with the 1st reef still securely in place (I think it may stay that way through this whole trip!) 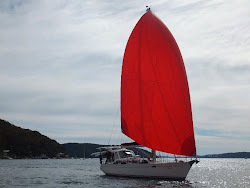 plus the full headsail and we moved out into coastal waters at a fast boat speed of 7-8 knots. Quite speedy for Southern Belle. The coastal scenery along the Freycinet is quite dramatic. The granite cliffs drop vertically down to the ocean and they're coloured in places with pinks and red from the iron ore deposits & lichen. From the ocean they appear imposing. No shelter, no forgiveness, no hope if you come to grief before you find solace in on of the few bays available for the traveller. We were blessed. We made the trip in good time with a great wind angle and excellent sailing ... right through the Schouten Passage and into the calm, clear waters of Bryans Corner. The clear waters and white beach at Bryans Corner. Crossing the passage in the "Shuffle" ... it is very roomy.... not problem with coming into it or crossing. We woke to this sight in the Bay on Schouten Island. Lovely. In the morning we said goodbye to our new friends and moved off further south down the Great Oyster Bay. Our first stop was White Rock. This is right smack in the middle of the road between Schouten Island and Maria Island. We met a lovely couple in Wineglass Bay the first night we were there who - amazingly - were from the 'Alfreds' yacht club on the yacht "Manutai". Over cups of tea they told us about White Rock and it's seal population who, when you approach in a boat will jump excitedly into the water and bark and squawk as you pass. So we had to pass as close as possible to this big chunk of rock to see the seal population for ourselves. White rock ahead! This "island" just sits right in the middle of the Great Oyster Bay. There were seals all over the southern facing shore of the island. As we passed the seals barked and jumped into the water to chase the boat! This picture does not do the experience justice. on "Manutai" at Wineglass Bay!!! Another bit of "Local Knowledge" that our friends on 'First Light' gave us before we left was .. if we wanted fish and chips we should call into the little fishing town of Triabunna to sample the great food coming out of the small "fish van"! So that was the next place we sailed for. George and Bruce stowing the dingy next to the bus for the Maria Island tour. This little fishing town is also the ferry departure place for the national park island of Maria Island.....our next stop! The Fish Van in Triabunna. That little fish van made the best fish and chips I think I have ever had...anywhere!!!! Fresh, succulent, sweet and tasty .. so good. After Triabunna were moving to Maria Island for the night. Tomorrow morning we need to wake up at 5am in order to make the 2 hour journey down to the Dennison Canal for the crossing which will take us closer to Hobart and our destination for the Christmas and New Year week. I have to say this....the first days we were here it was blowing like hell. Every day we'd wake up to a strong wind warning. I was seriously starting to think this 3 month cruise was not for me. There was no way I could endure 3-4 months of howling winds and high seas. But today it settled down and it looks like it will be much more settled over the next week. One thing is for sure, Tasmania is wondrously beautiful. Full of good people and good food and good everything else it seems ... except weather. The past 2 days have given me an opportunity to see through the gales and appreciate the wonder. May it last. Hang in there! See how much fun it is? Life always throws some tests at us just to remind us we are on the top side of the dirt - or water! This is so beautiful, and I'm now craving fish. We had fire ants before you left. We can kill them these days if we try, but these striped bastards are horrid! Merry Christmas! Seems strange that it's the beginning of summer for you. It's seasonally cold here - thirtys in the mornings, fifties in the afternoons. I do think we will have another Epic Snow Event this winter, though!!! Enjoying Hobart in our new (?) car! Tasmania - Calm & Wild conditions but we're here!